J.F. Brennan Company owns one of the largest fleets of heavy marine equipment north of St. Louis and can provide marine support for span switch outs, heavy picks, and salvage operations. 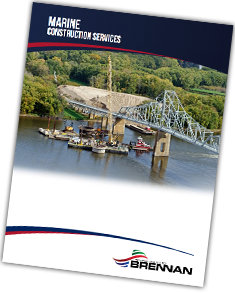 We cover the entire length of the Upper Mississippi River and its tributaries, but also have a large fleet of portable barges to assist in outlying bodies of water. In addition to our large marine assets, we have a staff of over 30 divers that can deploy quickly. Our dispatch center is open 24 hours per day, 365 days per year and is standing by, ready to help. Everything we do takes place around the water, and as a result, we have the right people, equipment, and programs necessary to mitigate associated risks. Working on barges with heavy equipment takes a special talent set to ensure the safety of the project. Our engineers have the specialized training in Naval Architecture Analysis to perform a marine plant stability analysis prior to any heavy pick. 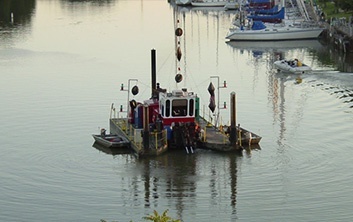 This analysis is performed specifically for the barge and equipment configuration that is needed for the project. We also help mitigate risk by having the appropriate levels of insurance coverage for all of our projects, including Marine Pollution Insurance. These measures are necessary to protect the operation and our client during critical times. Thank you for interest in our marine support services. For more information on Brennan, download our marine construction brochure. Want more information on our Marine Support services? Fill out the form below!